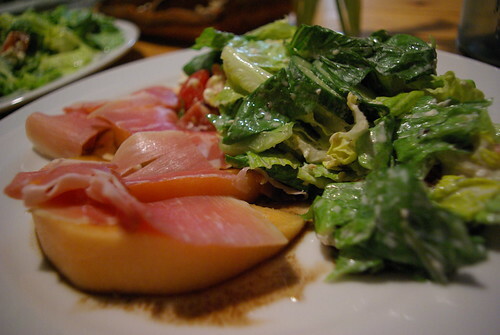 prosciutto on melon with balsamic reduction, originally uploaded by aarn! +14th July, 2008+. laid some thick slices of melon over a reduction of balsamic and grand marnier (3:1), topped with some large crystal sea salt and placed some slices of prosciutto on top. served with a salad of romaine hearts, cucumber, and tomatoes, tossed in some of the garlic dill and balsamic mayo.